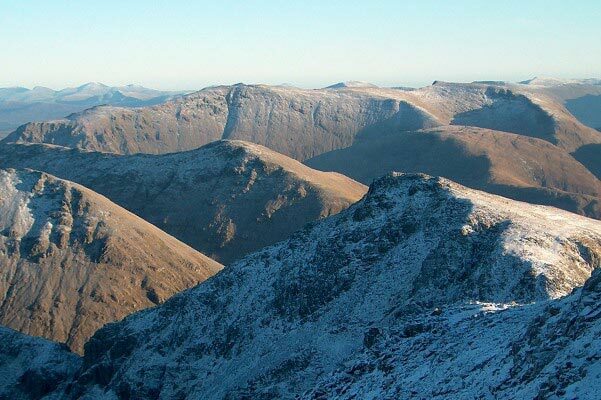 Creise lies on a long ridge that runs from Clach Leathad in the S to Sron na Creise in the N. The main ridge has steep slopes and many craggy regions which necessitate scrambling. 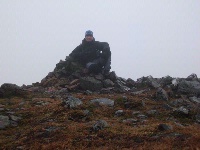 Creise can be accessed from Meall a Bhuiridh to which it is connected by a col S of the summit. The ascent to the summit from the col is steep and can be difficult in snow. To the N of Creise is Stob a Ghlais Choire (996m) from where ridges lead NE, N to Sron na Creise, and NW. 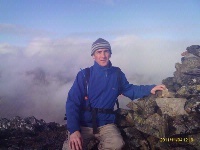 An ascent of Sron na Creise is possible but is a steep scramble in places. The NE ridge of Stob a Ghlais Choire can be ascended from Cam Ghleann and this is easier than Sron na Creise but still a scramble. The summit plateau of Creise; June 1981. 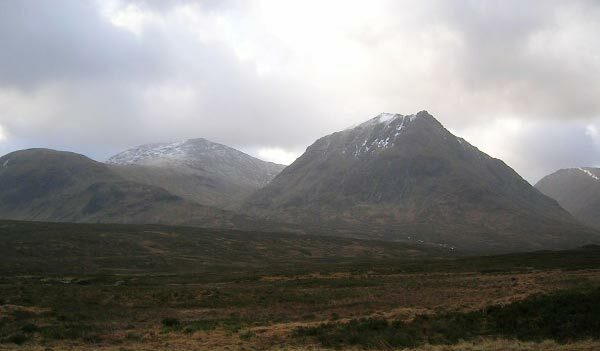 Creise and Meall a Bhuiridh from the A82 on a cold january day 05. Sron na Creise from the east, March 07. The high ridge from Stob a'Ghlais Choire over Creise to Clach Leathard looks almost level from a distance. View from Bidean nam Bian, looking over Stob Coire Sgreamhach and Stob na Broige, in mid-November. The summary information of one or more ascent routes that include Creise. 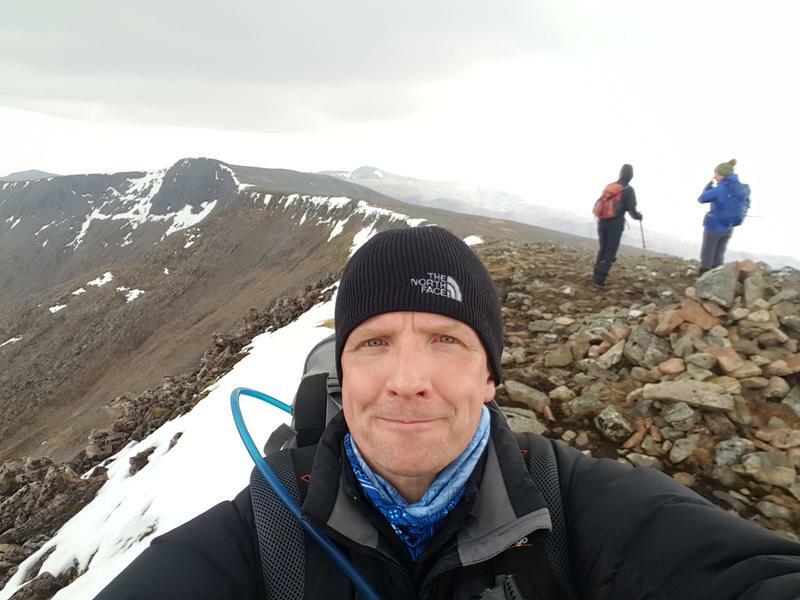 1 950 m 11.05 km 4 hrs Meall a' Bhuiridh and Creise The ascent of Meall a'Bhuiridh is easy, but the route onward to Creise is more difficult as there are crags to be negotiated, and scrambling skills are needed. Post a few words about Creise or read what others have had to say. Climbed via Sron na Creise. Searched out all the scrambling possible. Brilliant rock, great situations and a no serious feel to the scrambling. Good value and a great prelude to the walking. Highly recommend this to all. Absolutely brilliant days walking not a cloud in the sky the views were unbelievable unexplainable to the non walker, i could have sat up there all day looking at the views. Black Mount Estate 01838 400 255; permitted route during stalking 1st August to 20th October 2007, including weekends. From Blackrock Cottage round to the north ridge of Sron na Creise and along to Clach Leathad and Stob Ghabhar. Also connecting ridge with Meall a’ Bhuiridh. Found that ice axe and crampons were pretty crucial to success on the ascent from Meall a' Bhuiridh to Creise, which is not too steep and probably straightforward in summer but had a few steep snow slopes to climb.